This, in the long run, results in escalated food costs and ultimately a potential loss for your business. Here are a few tips that will help you in keeping your food costs in check. One of the most ideal approaches to avoid such situations is by taking shelter to a robust restaurant POS which has a stellar restaurant inventory feature. Having a smart POS on board will tackle half of your issues. A restaurant owner would put resources in technology if it made day-to-day operations more efficient. 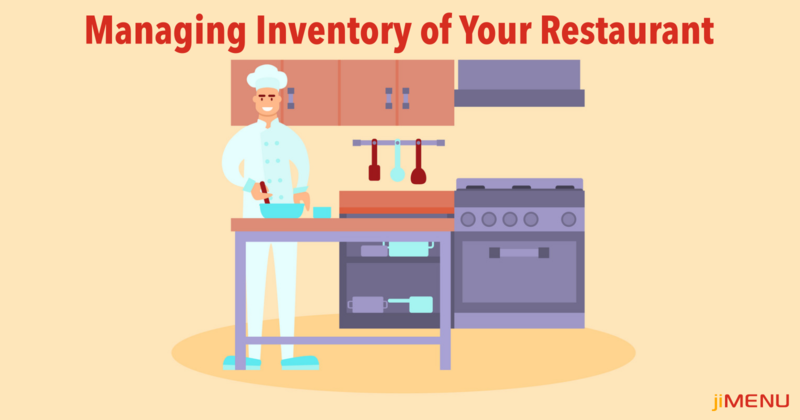 Restaurateurs have inventory management as one of the top challenges in dealing with a restaurant. Thus, keeping a sharp check on your stock and inventory becomes one of the basic requirements of running a successful restaurant venture. Here are the things that you should do to deal with your restaurant stock and inventory so as to not miss out unnecessarily. Recipe Management: Having a standardized formula is essentially important for managing the restaurant inventory and controlling the food costs. Generally, in a standard recipe, the amount of each ingredient that goes into making the dish is explicitly specified. These ingredients even incorporate the items that are required for garnishing. Not only is the quantity of each ingredient mentioned, the set process for preparing the dish, along with the necessary temperature is mentioned. This, not just aides in maintaining a consistency in all the dishes across the outlets, it also helps in ensuring that none of the items is undercooked or overcooked, that may prompt the generation of kitchen waste. Hence, while there is numerous restaurant software available in the market while choosing one, ensure that your restaurant management software has a recipe management feature. Here you can put all your recipes, to survey the use of raw materials with respect to sales. Checking Stock: Since the cost of raw materials is soaring high, it makes checking stock religiously and diligently more important. Hence, before bringing in more stock, make sure to check your inventory, and see how much is available, since you should order raw materials according to your requirements. If you think that calculating stock on a daily basis is a tiresome job, then an inventory management will prove to be useful. Most of the restaurants as of now utilize such a restaurant management software, hence if you are not, then you are certainly lagging behind. Such a software gives you the available stock count at the start and by the day's end. It at that point computes the balance stock automatically and tallies it with the available physical stock. Reporting and Analytics: It is important to have detailed reports to analyze the restaurant inventory so as to choose the future game-plan for your restaurant business. The sales and the raw material usage report figures the future raw material demand and to create future plans. Profit and loss reports are generated upon the stock sale and consumption. Keeping a Check on Raw Materials: Taking into consideration the high costs of the raw materials it becomes essential to keep the wastage to a minimum. Managing the inventory smartly is important to avoid wastage. Use these points to make sure your stock is efficiently used. Keeping a tab on your restaurant inventory is essentially important if you do not want to lose money unnecessarily. The restaurant industry is notorious for internal theft and pilferages, inventory is that segment of the restaurant where the possibilities of such instances are rather high. So as to maintain a strategic distance from any situations, it is highly prescribed that you keep the above-mentioned points in mind, and install a robust restaurant management software, that will assist you with having an overflowing cash register in your restaurant business.